Yikes, do you make one great big mess when you pour? I’ve had paint almost everywhere. On the cat, on the bed, on the floor, all parts of my body, on the door handles, the taps, the table, the walls, and especially my hands and nails – yes, pretty much everywhere can get covered in paint. Clean up can take a long time and after a few days of painting I was finding that under my nails and the skin around my nails – well, it looked like I had just dug myself out of a hole somewhere. Something had to be done! So I’m sharing my little secret with you today. How to make cleaning up a breeze. 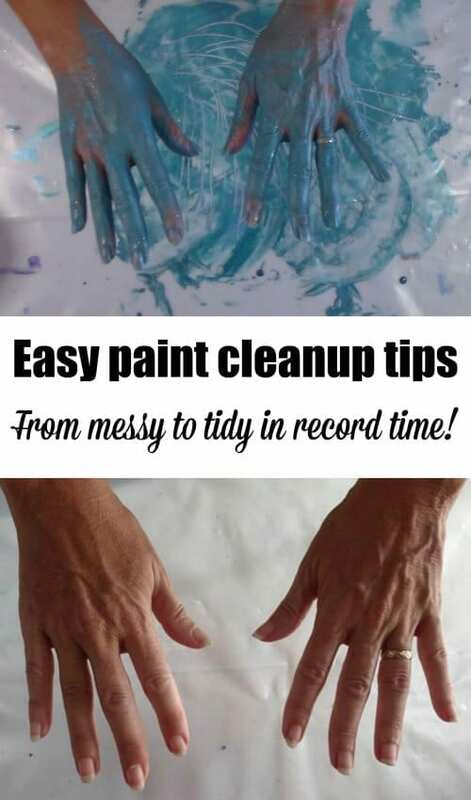 How to prevent the paint from sticking to you too much in the first place, and then how to remove it easily. I’ll throw in a bonus tip and show you my favorite cleaner for removing dried on paints in seconds. I recommend you save yourself some money and some clean up time by investing in a good quality plastic to cover your work surface to begin with. That thin flimsy plastic is all static and difficult to work with, thin so it can move about a lot, needs replacing every time because it can’t be cleaned. Instead, invest in a single roll of the thicker plastic and clean it off quickly every time. In all the time I’ve been painting, I’m still only on my second piece, and even then it’s only because I made a hole in the first one with my torch! You’ll save money and time because you won’t need to be constantly changing it and disposing of it. Get the 4mil weight. It’s so much better than that tissue thin stuff. Or of course, you can always wear gloves if you want to. I find that the gloves get really slippery when wet with the paint, and I’ve dropped tiles and paintings while wearing them because I just can’t grip the same way. Plus for me, getting messy is part of the whole art experience. There are a huge number of exam gloves on Amazon. Just found you as part of my new hobby-acrylic paint pouring! I always admired you from the sewing tutorials you did and now you can teach me this! Looking forward to seeing more of your lessons/experiments etc and enjoying this new venture. Best regards and good luck with your art projects ??? Thanks Emmy. This painting has become my new passion and I’m hoping to share it with everyone. Thanks for following along. Do the cells last permanently, or do they disappear in the drying time? The cells in these paintings should last once dried and become permanent. Most of my videos and blog posts show photos or video of the paintings both while they are wet and then when dry later too. My cells tend to disappear after they dry. It sounds like perhaps your paint is just a bit too thin and continues to move and the cells soften and fall apart while its drying. Or maybe there is too much water and the paint binders are weakened and can’t hold the structure of the paint together. We have a document in the chat group files on this subject. Are you a member? Come join us for troubleshooting here. I have found rubbing a little petroleum jelly around my nails before starting helps with the zombie nail effect. Of course, if you want to let everyone at the grocery store know you’re an artist, go get your gallon of milk without changing clothes or washing your hands. It starts some amazing conversations in the checkout line. Please Deby, protect our water supply from plastics and don’t wash down drains. I use a bucket of soapy water and use evaporation then peel off the plastic film. I do Kathy, all the time. I wash all my stuff in buckets and take care of the paint residue at the bottom carefully. My very painty hands that I washed in the sink was just an exaggerated example for this video.